" WE MUST CONTINUE TO MAKE OURSELVES HEARD AND TO BE NOTICED, THIS IS OUR COUNTRY, OUR TAX'S, AND THEY ARE EMPLOYED BY US, WE MUST THEREFORE USE OUR RIGHTS OF DE-SELECTION." 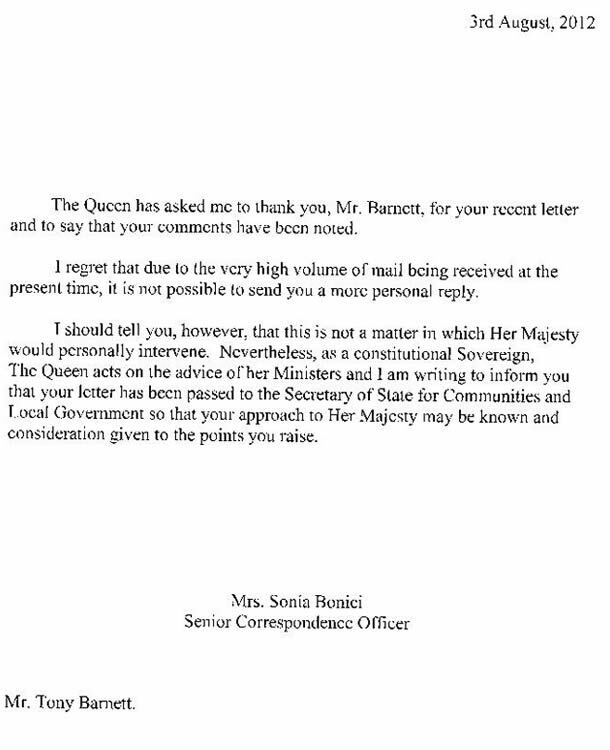 AS THE ROYAL LETTER PROVIDES, HER MAJESTY IS NOT PERSONALLY ABLE TO INTERVENE, BUT AT LEAST THE QUEEN HAS REFERRED MY CONCERNS TO THE APPROPRIATE MINISTER, SHE CAN DO NO MORE. HER MAJESTY CANNOT BE HELD RESPONSIBLE FOR THE TOTAL APATHY, SHOWN BY HER MINISTERS, THEY ARE NOT OF ROYAL SELECTION TO THE POST'S THEY HOLD, WE THE PUBLIC PUT SUCH PERSONS FORWARD, TO ACT ON OUR BEHALF IN PARLIAMENT. I SAY WE, I EXCLUDE MYSELF FROM THAT STATEMENT, WHY HIRE OTHERS TO DO A JOB, WHEN ONE IS ABLE TO DO IT ONE'S SELF, UNTIL THE ELECTED MP's, COUNCILLOR'S, COMPLY WITH THE PROMISES THEY MAKE TO THE ELECTORATE, THEN WE MUST BRING THEM TO BOOK. THE PERSONS ELECTED BY THE PUBLIC, ARE NOT NECESSARY THE PERSONS HER MAJESTY WOULD HAVE IN MIND TO REPRESENT HER GOVERNMENT, HOWEVER, SHE HAS, I SAY, THE MOST UNENVIABLE DUTY TO GIVE ROYAL ASSENT TO BILLS PASSED BY PARLIAMENT, THE SAME MP's THE BRITISH PUBLIC VOTED IN POST, THESE THEN ARE THE LEGISLATORS, YOUR CHOICE, BLOODY WELL REMOVE THEM! THE PERSON'S ELECTED AS MP'S, ARE AT THE NUCLEUS OF THE CRIMES, BEING COMMITTED BY NATURAL ENGLAND, IT WAS THE SAME MP'S THAT NATIONALISED ENGLISH NATURE TO BECOME THE MOST DISLIKED QUANGO EVER TO BE OFFLOADED ONTO THE BRITISH TAX PAYER "NATURAL ENGLAND"
THIS QUANGO IS NOT OF CONSENSUS, IT IS THERE BECAUSE MP'S HAVE PUT THEM IN PLACE, COMPLAINTS HAVE BEEN SUBMITTED BY MAUREEN COMBER TO THE NATIONAL AUDIT, THEY TOO IT SEEM'S HAVE A "GET OUT" CLAUSE, LIKE THE PLANNING INSPECTORATE, DEFRA, LAND REGISTRY, LOCAL COUNCILS, COURTS, POLICE AND OF COURSE MP'S, "IT IS NOT APPROPRIATE, IT IS NOT COVERED BY FOI," AS MAUREEN WAS TOLD "THESE MATTERS ARE OVER 12 MONTHS OLD, AND SO ARE NOT VIABLE". WE MUST CONTINUE TO MAKE OURSELVES HEARD AND TO BE NOTICED, THIS IS OUR COUNTRY, OUR TAXES, AND THEY ARE EMPLOYED BY US, WE MUST THEREFORE USE OUR RIGHTS OF DE-SELECTION.